At Acres Pharmacy, we provide supplies and medications for ALF (Assisted Living Facilities) and Group Homes that are located in the Lehigh Acres area. We accept requests for prescription medication and over-the-counter pharmaceuticals. Items may be ordered in batches for the residents and/or participants in Groups Homes and ALFs. We invite group homes and assisted living facilities to work with Acres Pharmacy. You can count on our staff to provide for the health care supply requirements and medication needs of your residents. Upon request, we can also provide medication reviews and/or prescription reviews for potential drug interactions. To set a schedule or to place a prescription order, please call 239-674-9737. Inquiries are also accepted via our online contact form. Our goal is to ensure that the transition process is as seamless as possible and without interruption of service. With understanding of the demanding nature of the day-to-day operations of your business, so to support our facilities we have implemented the three step process outlined below to reduce stress, maintain quality and promote open communication. Prior to the current pharmacy‘s last day of service, a member of our team will come to your facility and make copies of insurance and acquire all demographical information for all current residents (this step can be done by facility staff if preferred). Our pharmacy staff will create both personal and medication profiles for all the residents within reasonable time. We are now ready to service your residents with their prescribed medications! Communication is key to your success as well as your success during a pharmacy transition. To better support this process, at your request, Acres Pharmacy will provide you with a welcoming letters to introduce our pharmacy and services for distribution to the responsible party and/or power of attorneys. .
As you can see, we utilize a system of conversion that is easy and efficient while requiring little involvement from facility staff or family members. Billing & OTC Products: Acres Pharmacy guarantees that we will provide billing statements that are clear, concise and accurate. In the event that there is uncertainty in the bill, our team is ready and equipped to explain, verify and/or resolve and issues that may surface. In addition, due to today’s burdensome cost of medications, our team is available to review over the counter medications often exempt from insurance coverage to determine the most cost efficient means to provide them. Ordering: ACRES PHARMACY efficient automatic refill system dramatically reduces the risk of running out of medications. We refill most routine orders automatically, allowing facility staff to focus on the residents and not the medication cart. Delivery: ACRES PHARMACY drivers are made aware of pharmacy practices and standards. They adhere to HIPAA and have been trained to meet or exceed our standards of customer service. Our dedicated, courteous drivers make the medication check-in process quick and easy. The result is superior service for the facilities. Consulting Services: We offer detail-oriented reviews performed by pharmacist with strong clinical backgrounds in geriatrics. We also assist ALF & GROUP HOMES to state surveys to ensure accuracy and compliance with state and federal requirements. Med Carts: Acres Pharmacy offers free medication cart to meet the needs of the facility. Carts are equipped with quick change draw dividers as well as eMOR reinforced and ready. Training and Educational Classes: Acres Pharmacy will offer free training and in-service programs including the annual 2 hour re-certification class as required per Section 429.256, F.S.. Customer Service: Our pharmacy team provides responsive and reliable service; immediate, same day resolution is our goal. Whether the issue is a missing medication, orders requested too soon, or helping with the discharge process, the pharmacy team is prepared to provide first-class support for nursing staff. Our trained staff listens to the shift specific, unit specific and nurse specific, concerns of each facility. Our dedicated, knowledgeable, caring team is the heart of our proactive, issue resolution approach. MORs Service: ACRES PHARMACY provides monthly MOR service, customized for each facility. We offer both the traditional paper MOR or the new electronic MOR operated by Electronic-MAR which is a web-based medication observation record and ordering system that virtually eliminates the need for paper during a med-pass. 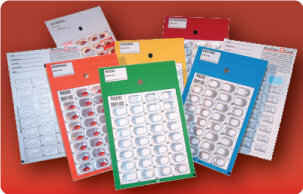 We offer multiple option of drug-packaging systems such as various forms of punch cards (traditional blister cards), MedTime cards are produced with bright colors for easily identifying and systematically administering medication by daily time passes. They are printed with Morning, Noon, Afternoon, Evening, Bedtime, and PRN. They are also available in Unit Dose/Reclaimable packaging and traditional bottles just to name a few. These packaging systems are intended to best streamline med-passing processes, increase staff accountability, and reduce the opportunity for medication errors and thus liability. We also offer from traditional medication vials to more sophisticated system to improve compliance at the request of a patient or authorized individual for a nominal fee. 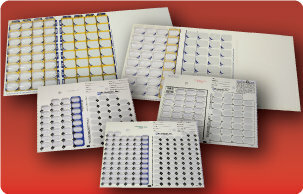 Healthmark RxMap™ Tri-Fold cards are designed to help increase medication adherence for patients on a complex regimen of oral solid medications.